Grossy privet fruit (Nuzhenzi)-Ligustrum lucidum Ait. Botanical Name: Ligustrum lucidum Ait. Part Used & Method for Pharmaceutical Preparations: The ripe fruit is gathered in autumn, then steamed and dried in the sun. 1. Deficient yin of the liver and kidneys manifested as early graying of hair, decreased eyesight, dryness of eyes, tinnitus and soreness and weakness of the lower back and knees. 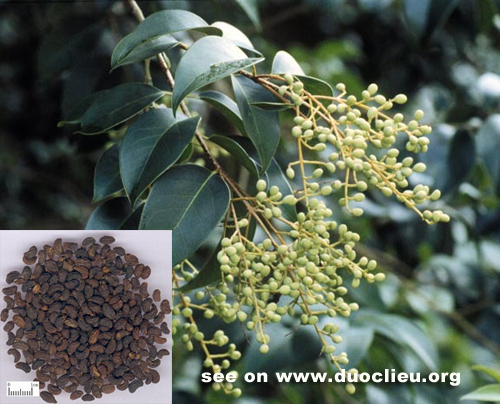 Grossy privet fruit (Nuzhenzi) is used with Mulberry (Sangshen), Eclipta (Mohanlian) and Wolfberry fruit (Gouqizi). 2. Deficient yin and heat. Grossy privet fruit (Nuzhenzi) is used with Wolfberry bark (Digupi), Moutan bark (Mudanpi) and Fresh rehmannia root (Shengdihuang). Cautions & Contraindications: This herb is contraindicated in cases with diarrhea due to cold and deficiency of the spleen and stomach, or yang deficiency.